Dulcimer #24 is the only dulcimer I have in my possession from the first phase of my life as a dulcimer maker. The dulcimer made its way back to me a few years ago and has spent most of its time hanging on the wall since its return. I began making dulcimers on the kitchen table when I was 17. My mother was thrilled. 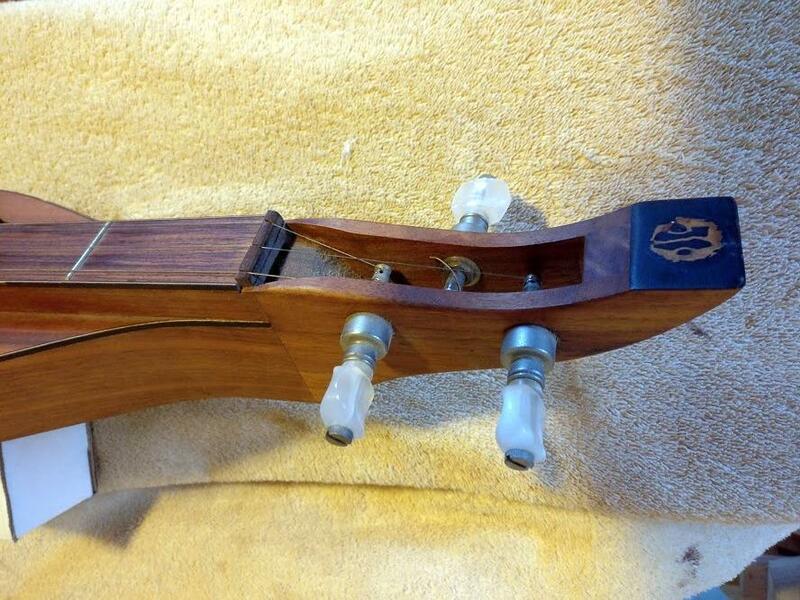 I continued making dulcimers in several places I called home until I moved to Boulder, Colorado in January of 1984. For various reasons I felt I had to focus on either performing or lutherie and I put instrument making aside for about 25 years. I always missed it. I took dulcimer #24 off the wall today and studied it. The dulcimer is dated 1979/1980 so I was 21 when I started making it and probably 22 when it was finished. If I remember correctly I moved 3 times while building it! I used variations of this body shape and peghead design for a few years. The slice of a black walnut inlaid in ebony on the peghead was a signature until I started using flat pegheads and couldn’t find a place to inlay the walnut. I think there are a few dulcimers out there that have the walnut inlaid in the strum hollow after I switched to flat pegheads. 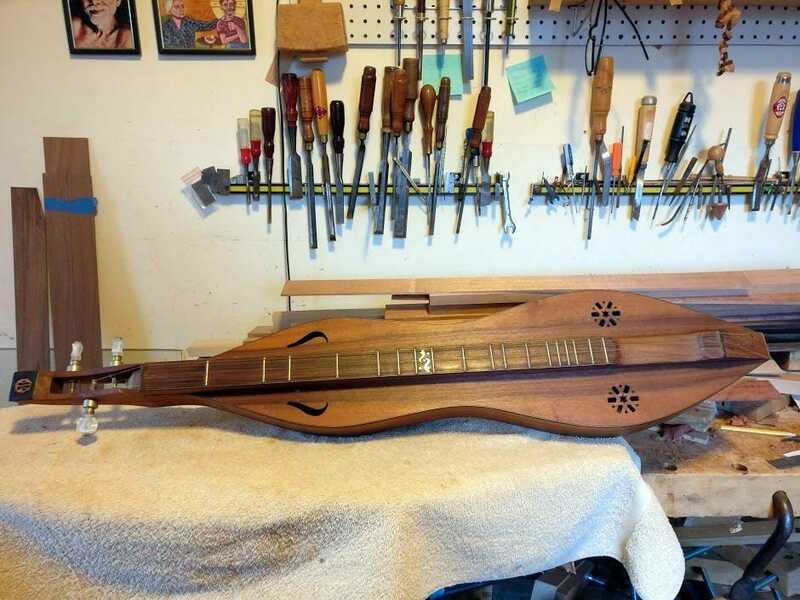 This dulcimer might be the second one I made that has binding and probably the only one that has a bound fingerboard. The soundholes on the lower bout came from the center portion of a lute rose I found in a book. I used these soundholes on several instruments. Aside from the looks I chose to do a soundhole with multiple piercings to help keep the soundboard stiff. It seemed like a good idea at the time. In retrospect it was a lot of work and acoustically unnecessary. The soundholes on the upper bout made their way onto quite a few dulcimers. The body is straight and narrow between the nut and the first fret. I had a reason for doing this but can’t remember what it was. I’m sure it seemed important at the time. The top, back, sides, and peghead are made of walnut and the fingerboard is Brazilian rosewood. I had not yet begun to resaw wood myself and the walnut and rosewood most likely came from Gurian Guitars or Luthier’s Mercantile. For some reason I used a piece of maple for the endcap over the tail block. I have no idea why. The position markers at the 7th fret reflect the shape of the upper soundholes. I didn’t do the greatest job cutting and filing the pearl to shape and the curves are a little off. I remember I hated cutting pearl; I still do, but would do a much better job if I ever chose to do it again. I used the word “do” 3 times in that last sentence; just thought I’d mention it. To my much-older eyes the body shape looks bulky. The workmanship is a little on the rough side but by “dulcimer standards” of the day it was actually pretty good. My sharpening skills were not well honed in those days (sorry for the pun) and it shows in the dulcimer. I was also young, a bit impulsive, and didn’t take as much time with details as I do now. The dulcimer is finished with Danish oil and it has held up well. The 1st and 2nd strings sound surprisingly good to my ear. The bass string sounds brighter than I would prefer and is most likely due to the soundboard being a little too thick. I can’t remember what I did for bracing and haven’t looked inside with a mirror. I imagine there is more bracing on the soundboard than necessary. I was into that for a while. I’m thinking of refining and reviving the peghead design. I always liked it. I’ve thought of working up a model with a different body shape and I may include the straight area between the peghead joint and the first fret. You can see photographs of my work in progress by following me on Instagram. It’s cool that you have such a long range overview of your work. One of the most instructive aspects for me has been to live among early pieces of furniture that I’ve made and pondering what has succeeded in the piece or not. A detail that felt so urgent to include or proportions arrived, etc. The final judgement comes down to whether the piece is something you enjoy living around and why that may be so. I like your thought about enjoying living around a piece. I judge my instruments by whether I enjoy playing them and if so why, and if not, why not. The visual and textural aspects are a part of that; does the dulcimer invite one to play it in the first place!